I used to be a teacher and now work in an office translating documents. junior high school students, they couldnt communicate yet through English. was quickly approching so I assumed I didn’t even get an interview. would continue to build my Japanese skills. that was really for the best. will take quite a few years. yes.. I do enjoy my job and I hope that I will be able to continue it. About Ryohei and his work..
acceptance rate. There are many different approches to studying..
self-study, going to a special cram school. blind luck. negligence..
which he will be studying crazily for he plans to get a parttime job..
after March when I can actually write about different things..
And that concludes todays episode of the Sarah show..
Edited to remove some irrelevant information. So I am back from my weekend in Tokyo! I flew back from Haneda to Kobe this morning with the plan of going into work for a halfday, but I was just so exhausted that I decided to take the whole day off and rest. We had a pretty busy weekend and I have an interpretation event tommorrow so I didn’t want to burn out before then. 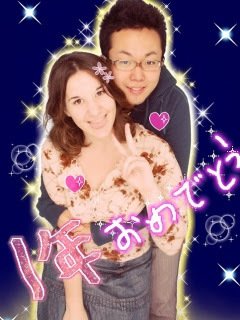 So this weekend was Ryohei and my 1st anniversary! I arrived in Tokyo by bus late Friday night. I take the bus from Osaka to Tokyo and its about 8 and a half hours which is soooo long. Espicially if I can’t sleep. I had Nanny Diaries to read, which I finished in about 3 hours so the other 5 I was just sitting their getting all crotchity. And also Ryohei and a nomikai that night so he couldnt come to the station and pick me up but he told me to email him when I got there. Which I did.. 5 times.. no answer. So at this point I am tired and cranky and I was about to say I’ll just meet you at your house.. (angry face) but then he came up behind me at the platform near Shinjuku and suprised me. Needless to say, Friday was just a crash exhausted night for both of us. Saturday, Typhoon 20 decided to grace the Kanto area of Japan with its presence. Despite the fact that I would have been perfectly happy to stay indoors all day, Ryohei and I had decided long ago to buy one of those nice, 3500 yen cakes to celebrate our anniversary so off to Shinjuku we went in the middle of the typhoon (or it seemed like it to me). We were both soaking wet and cold, but we ended up get a chocolate and white chocolate cream cake which was yummy yummy and probably more calories then I should have consumed in a year.. but oh well, anniversaries are special! That night for dinner we made our special nabe and watched tv/relaxed. All and all a lazy but fun Saturday.. ohh I also introduced Ryohei to Godiva Chocolixor.. he became addicted opps!! Hehe.. I told him we can only have it once a month.. see I am a very kind girlfriend I think.. I don’t know if we can get it in Kobe so he better not be getting it behind my back in Tokyo!!! After the crazy rainstorm came a beautiful clear Sunday. 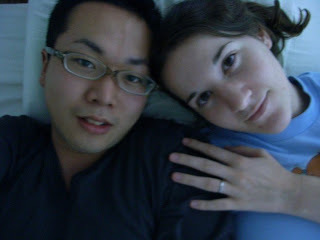 Which was the date of our actual anniversary! We slept in really late.. until about 11:30 yikes.. I haven’t slept in that late for a long time.. we had thought about going to the Ramen Museum in Yokohama, but since it was already about 1 by the time we got ready and I wanted to spend a full day there, we decided to head to Odaiba instead! 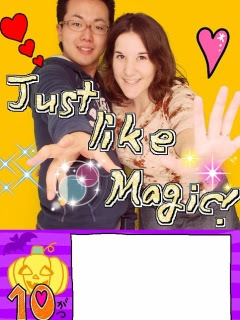 For our first date we went on the ferris wheel at the Osaka Aquarium so we decided to keep the tradition alive by going on the ferris wheel and Odaiba as well. We got to Odaiba around 2:30 and had an okonomiyaki lunch before walking around the fuji telebi place but it was just shops and so crowed so we gave it up and went to where the ferris wheel was instead. There was a video game arcade so Ryohei played some weird game and I spotted the Nova English Game.. yes, I decided to test my skills agaisnt the rest of the country haha.. Well.. I got about 2nd place in the Tokyo area.. Ryohei was so impressed.. actually it was a pretty good test because they would show the Japanese word and you’d have to pick the right English one.. so it was actually a nice review for me… there were some weird words too.. like “compounded” and “thirstily”… but yah.. 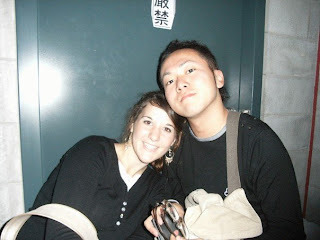 I was glad to impress my fiancee with my hot English skills.. haha.. We don’t speak English too often and I sound like an idiot in Japanese most of the time so it feels nice to show that yes I am proficient in SOMETHING! 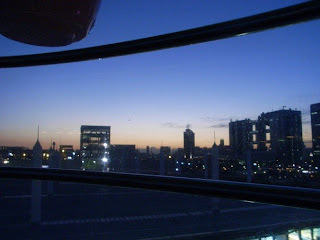 Anyways we lined up for the ferris wheel just as it was getting dark and saw a beautiful twilight view. It was soo beautiful. Afterwards we returned to his apartment and ordered Pizza Hut.. yum.. I don’t like the Japanese take on Pizza most of the time.. but that was very yummy~~ After dinner we talked about various things espicially his move here. I now have a pretty specific date!! March 8th or 9th!!! So only about 4 more months left!!! So it was a very fun weekend that ended too fast.. saying goodbye to him this morning, as usual was hard. I’ll be seeing him in another 3 weeks when I have a week long conference in Tokyo but 3 weeks is still hard.. I just have to keep telling myself its only for a short time..
Anyways Im feeling tired now so I’ll leave you all with a few pictures from the weekend! All right thats all for now!!! I hate waiting for things.. I have never, ever been patient. the last day of school in mid-June. something else to count down to..
transport) every weekend that I go out there. Pumpkin Latte, hurry up Japan!!!! Plans of mice and men and me.. I will spill his praises here, and wonder if someday he will find this..
touch and let me know that hes by my side. break and find a mail with something, anything from him. At night..
after the weekend sometimes its so hard to sleep. like Kobe, Tokyo, or Osaka. like to reread this post in 2,3 years.. I always enjoy reading my old diaries and seeing how things really ended up working out. of doing nothing at work! hurt the persons feelings, or I just flat out am too chicken to say no. And then.. as the event approches I suddenly don’t want to go or etc. etc… and then I try and get out of it and just end up looking worse. stuff for them. And it can be exhausting, espicially as I get older. me a while to access and procede with each persons personality type. maybe just shy. Large crowds or groups or parties just overwhelm me. Anyways we spend the weekend typically enough. Lazy, lazy lazy..
to find it somewhere! Anyways after that was sleep of the dead. Sunday – Got up decently early with a pretty full day ahead of us. really oily and made my tummy a little upset. Ryoheis tasted so good..
back, cuddled, and the sleep of the dead again. that I was feeling grouchy and my tummy hurt again so we went home. Ryohei made curry and we watched some TV specials. It was so nice, I love just spending the night with him at home alone. Tuesday – It was time for both of us to get on with real life aka work.. So we got up at the normal time.. early early and he headed to work and me to the airport to go back. Its always so hard to say good bye on the train but having people around makes it easier not to cry. Anyways this post is way late! But it really was a good weekend. I can’t wait to see him again for our anniversary at the end of the month. Comments Off on Gimme more! relax and not worry about anything. us. Like both parties feel that I’m not really one of the gang anymore. staying it is espicially hard to stay positive ALL the time. Tokyo, but I don’t want to be there. seperate entry once I feel a little better. Sorry to be all rant-y, but I guess thats what a blog is for..